Ababael Timsar-Dadisun, a Dunmer trader, is a Clanholder for the Ashlanders. Ababael Timsar-Dadisun can be found in his yurt located in the Zainab Camp. He buys and sells a wide variety of items and offers repair services. He wears a common shirt, common pants, and common shoes and carries on his person a master-quality repair hammer, random potions, scrolls and ashlander weapons, random pieces of chitin armor, the Merisan Helm, the Chest of Fire, a Holy Shield, a glass netch dagger, a steel longsword, a Water Spear, chitin throwing stars, chitin arrows, and 300 gold. Aside from his natural resistance to fire and the sanctuary provided by his ancestors, he knows no spells. 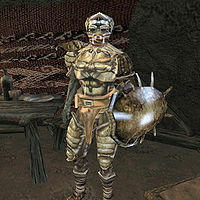 He is the richest non-creature merchant, aside from the test character Todd's Super Tester Guy, in Morrowind. Ababael is the master trainer for Mercantile,and a medium trainer in Armorer and Long Blade. Ababael is also the author of The Buying Game, a Mercantile skill book. As a result of his Mercantile skill, Ababael charges higher prices (and pays lower prices) than anyone else in Vvardenfell. However, his massive gold reserves mean that he can be sold items of great value that no other merchant could pay for, even if it means taking a substantial loss in terms of the item's gold value. This page was last modified on 2 March 2017, at 17:40.